There’s a lot of misinformation on the internet as to how to build a PWA and how “appy” and SPA-y one must be. This simply isn’t true. Disappointingly, It is what most of the documentation, blog posts and public discourse seem to imply. I’m so, so happy to see some pushback against the misinformation that progressive web apps automatically imply client-side rendered single page apps built from scratch. There’s so much value to be had in turbo-charging an existing site into a progressive web app. 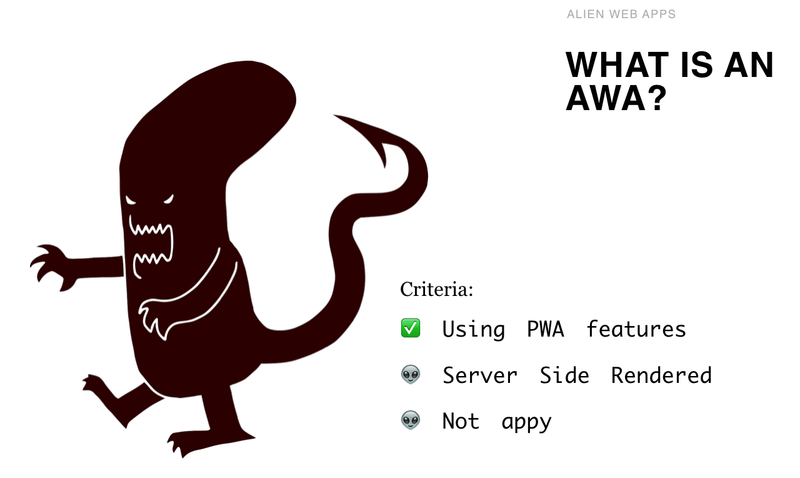 But what we don’t need is yet another TLA like Alien Web Apps.